In our fast pacing life and busy schedule we often neglect to take care of our skin. Due to this negligence, our skin has to suffer a lot. Any skin problem arises because of the contamination caused by germs and impurities. 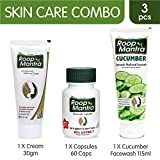 So, it is important to keep the skin clean and free from any impurity. Instead of using multiple chemical based soaps on your skin you should choose something organic and safe. It is because most of the soaps are acidic in nature and damages the skin in many ways. So, maintain your skin’s cleanliness by using natural products only and protect it from harsh effects of chemicals. 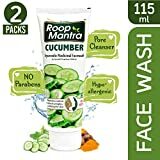 Roop Mantra brand has designed one such natural creation; Roop Mantra Cucumber Face Wash. It is soap- free formulation which helps to replenish lost moisture from your skin after every wash. 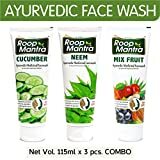 It is the best ayurvedic face wash enriched with Cucumber which gives a cooling and soothing effect to the skin and Aloe Vera that tones and softens the skin. Along with these two it contains herbs like Manjishta, Neem, Haridra, Kustha, Lodhra and Pudina. This herbal cucumber face wash moisturizes the skin and also cleanse it and gives the feeling of freshness. The abundant antioxidants in Cucumber rejuvenate the skin and keep it smooth and soft. Also the extracts of this skin care face wash helps to prevent dryness altogether and removes toxins from the skin. Cleaning your face with this Cucumber face wash helps to prevent pimples, acne and dark spots. It is effective in removing the facial dirt, extra oil, dead skin cells and other impurities from the face. This is because it provides proper cleansing and washes away all the settled dirt and germs. Previous PostHow to get instant Pain Relief from Sports injury?